Just one more look until next year. Dishes are so much fun to play with! I must confess~ I'm running out of room to store all the fun dishes I have collected in the last three years. Now for my Fall look. White with soft brown and yellow tones. The little spoons are in the shape of little nuts. I love the fall colors. We have a few trees in the garden that are very beautiful in the fall. But my dream is to visit New England and savor the enchanting fall leaves in reality. It gets real cozy around here in the fall and winter. Sitting next to the fire place and entertaining my family during the holidays is a real gift. Great fall look....your cabinet looks gorgeous! 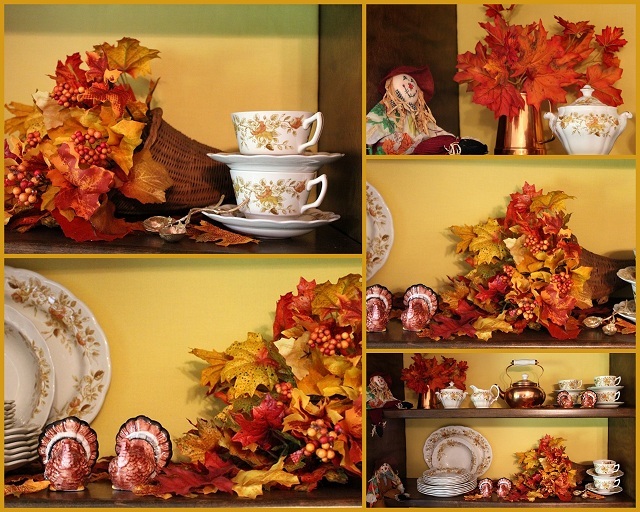 Betty, your autumn touches are lovely & inviting ... love the china. The dishes are perfect for fall. Love the turkeys and all the beautiful fall leaves.I too would love to see New England in the fall. My part of GA does not get a great show of changing colors. Enjoy your weekend. Looks great, those dishes are beautiful! Stop over for a visit sometime! Your collection is gorgeous! And I love that you didn't go over the top with bits of things - you let the pattern of your dishes take center stage! You are smart - using leaves & cornucopias instead of jack-o'lanterns, you can enjoy this lovely cupboard throughout the entire autumn season. The copper pitcher with the leaves is gorgeous, and your dishes are beautiful! I'm glad you shared this with us. Really pretty. Love the autumn colors! I love your transformation. Such wonderful harvest colors. Great to have you as a part of Seasonal Sundays.